Here, two 6′ x 30″ oblong tables are set end-to-end to create a 12-ft. table. With the large amount of decorative detail, generously proportioned 13″ chargers, and increased amount of china and flatware, however, it only seats 8. Using the more common 12″ charger, smaller decorative elements, and eliminating the bread plate would free up space for up to 12 guests. The Christmas holidays are a time for over-the-top tablescapes that have a lush, luxurious feel to them. Using an additional charger can help achieve that look and feel. I like to remove the first one after the salad course and the second after the entrée. (Formal etiquette calls for removing all chargers before the entrée is served, but many guests enjoy the additional razamatazz. Depending on who I’m entertaining, it might stay or go!) 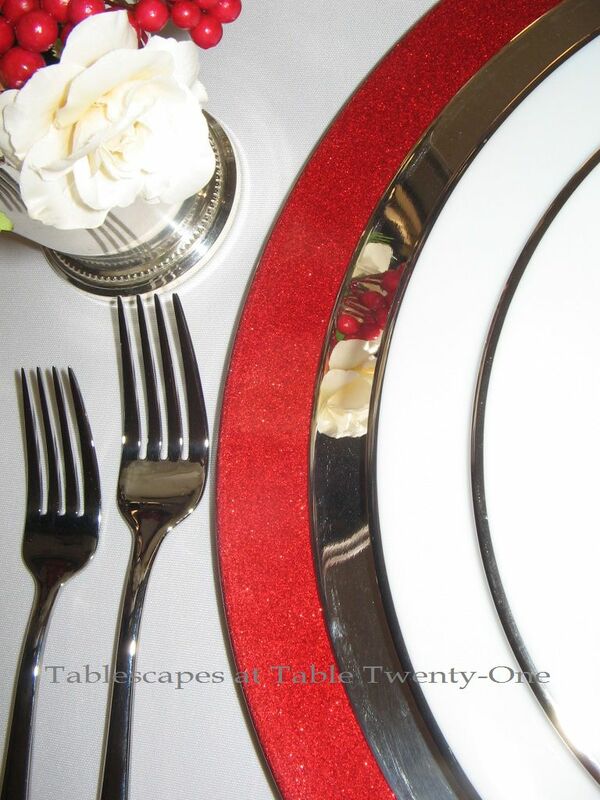 For this place setting, a 13″ sparkly red charger (Target) is topped with a 12″ silverplate charger. Any plates with a formal holiday vibe will work. I used my trusty Noritake “Spectrum” dinner and salad plates with the simple, sleek platinum band. 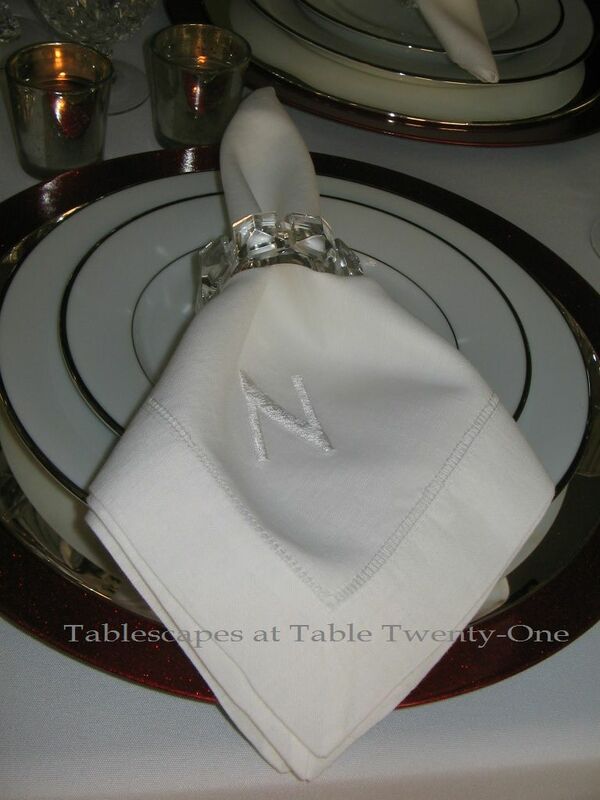 A crisp white cotton napkin with a monogram or initial is always perfect for a formal setting. 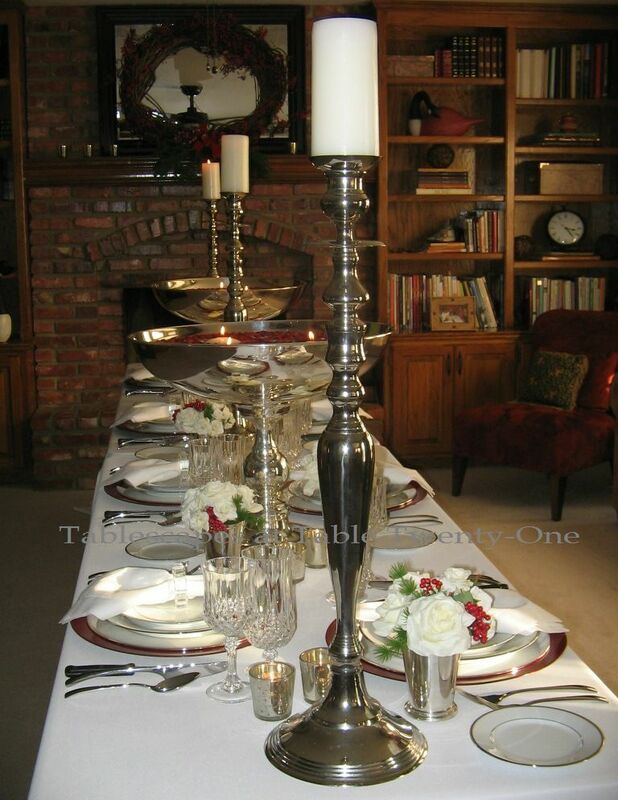 An icy crystal napkin ring from Z Gallerie helps to set this one off against the silver and white plates. J.A. 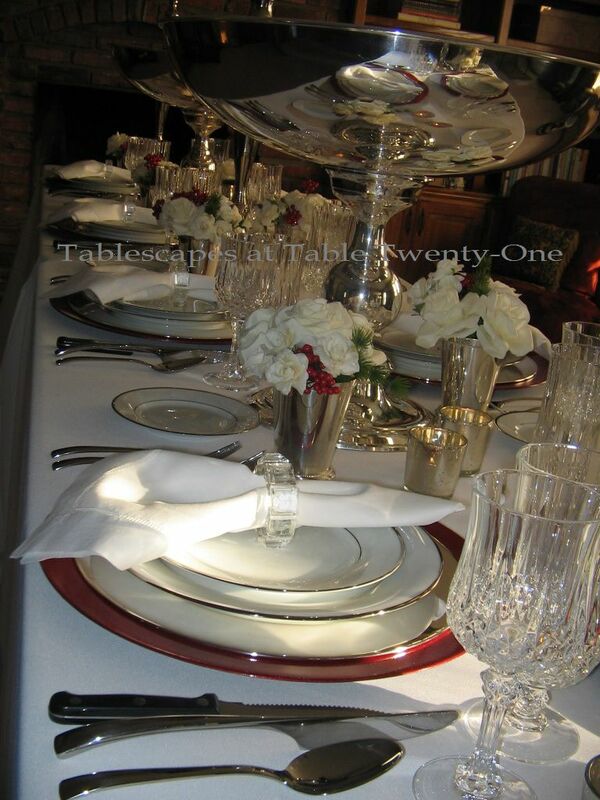 Henckels’ “Bellaserra” flatware has a beautiful mirrored finish that works well with the silver & white tablescape. 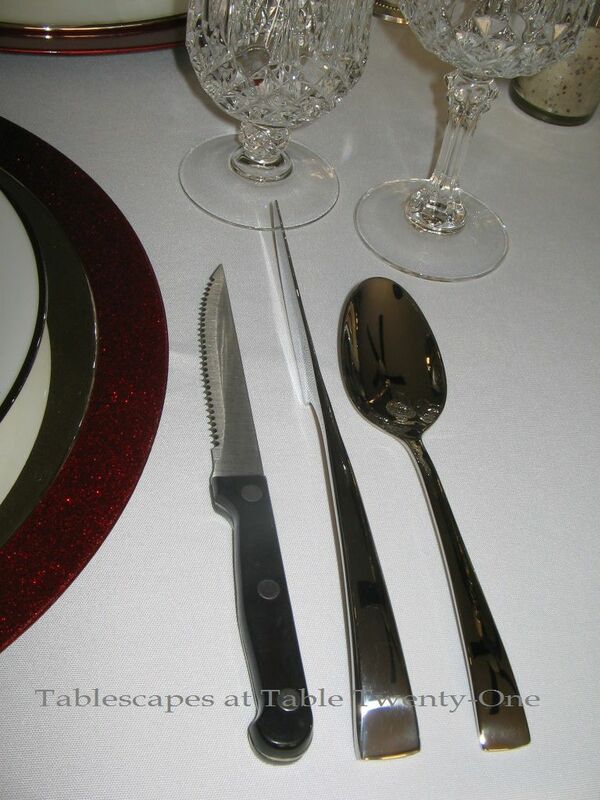 A black-handled steak knife is added for use with the entrée. 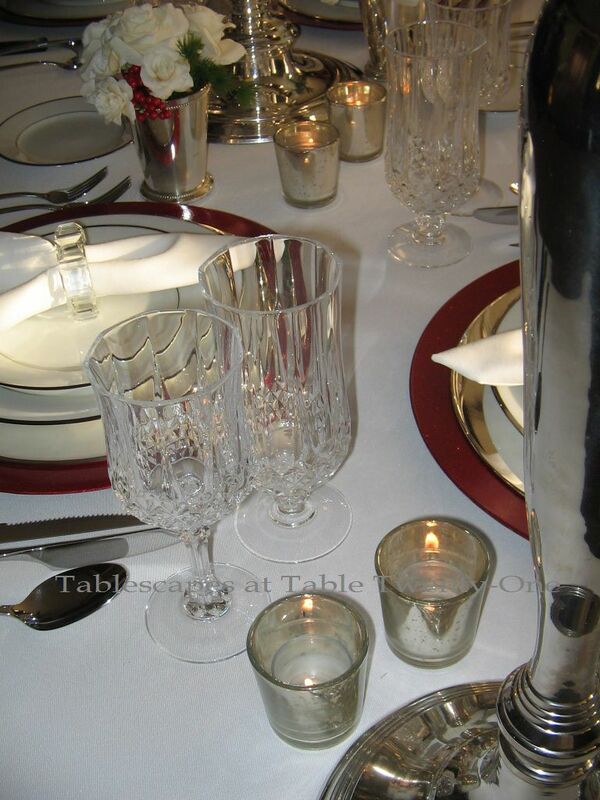 Cristal d’Arques “Longchamps” crystal stemware is always a nice choice. The diamond-shaped cut of this crystal mimics the cut of the Z Gallerie napkin ring. Placed at strategic intervals down the table are three 27″ silverplate candlesticks with pillar candles. The candlesticks lend height to the table as well as ambient light at a higher level. The rose-filled silver julep cups placed at each person’s place setting work well as tabletop decor during the meal and as a nice take-home gift after dinner. 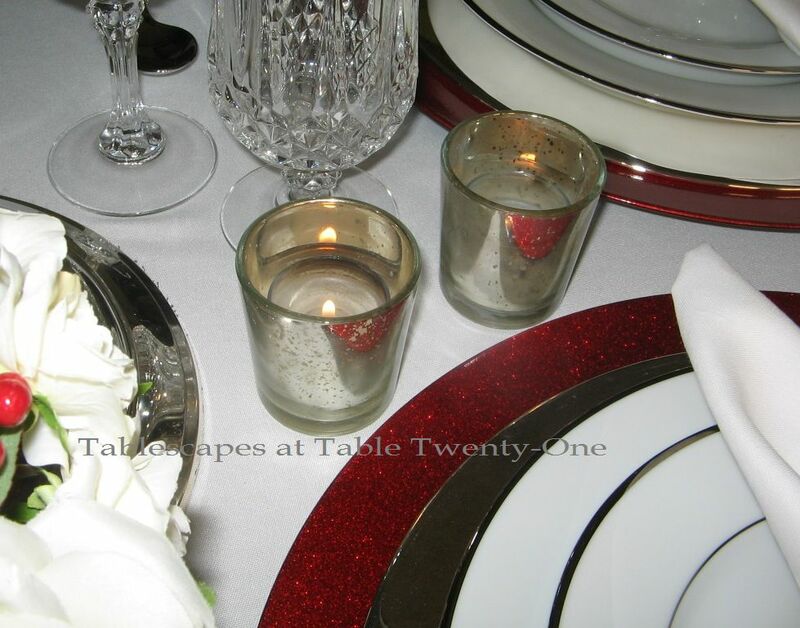 Ambient light at the lowest level is provided by silver mercury glass votive holders. 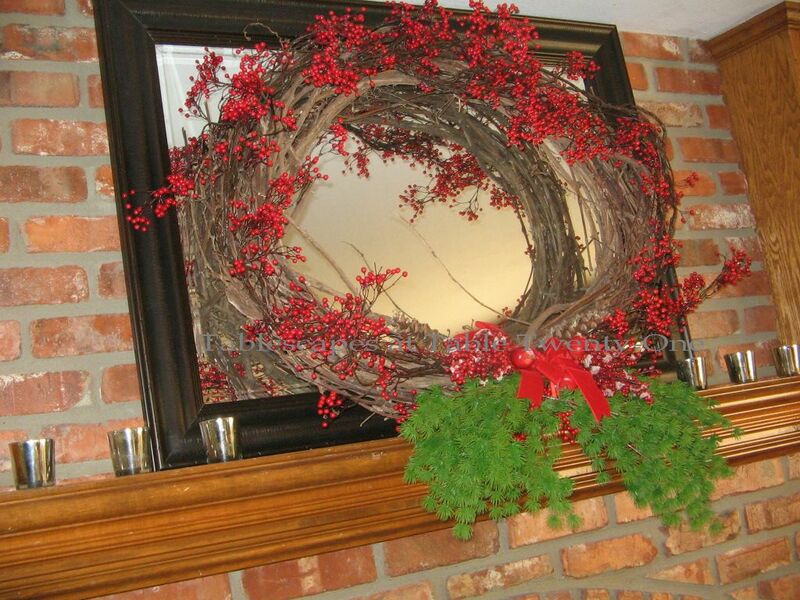 The red berry theme is extended with a berry-covered grapevine wreath over the mantel. The greenery on the wreath is the same used in the small julep arrangements on the table. Additional silver mercury glass votives flank the wreath. So…if you have space for a 12-ft.+ table, this style works very well. (Two 8-ft. tables would require additional decorative pieces, but would be extra FABulous!!!) Of course, it requires a bit more decor because of its length, but it’s the same as doing two rounds. To see the squared version of this table which can also be done with a round, click HERE. Fa-la-la-la-la-la-la-la-la! I am joining Susan and the other tablescapers from around our glorious world for Tablescape Thursday again this week. You’re invited to come along for the ride! Beautiful!! I love decorating at Christmas with cranberries! Wow. those tall candle holders are awesome! Oh, yes…the silver, huge, beautiful pedestal bowls…my heart remembers them well. I think I might have to just stop looking at your beautiful tables–the lusting HAS GOT TO STOP!! LOL! What a beautiful, striking table (as always), Alycia! And I love the subtle touch of red peeking from under the dishes, from the final charger. Are the chargers the plastic ones I see everywhere, or glass? They look glittery and fabulous. Thank you for another feast for the eyes. Oh, BTW…I want to attend one of your soirees where you’re giving the julep cups away, okay. Just call me when THAT day happens. I figure if I can bring my husband along we end up with TWO:)! (I have some and love them…a girl can’t have too many :). Love your posts, Alycia! Elegant and beautiful! Festive without screaming “Christmas”. Alycia, this is really lovely. I think cranberries make for a beautiful theme. I love that you stuck to only small touches of red, since it can be so overwhelming. 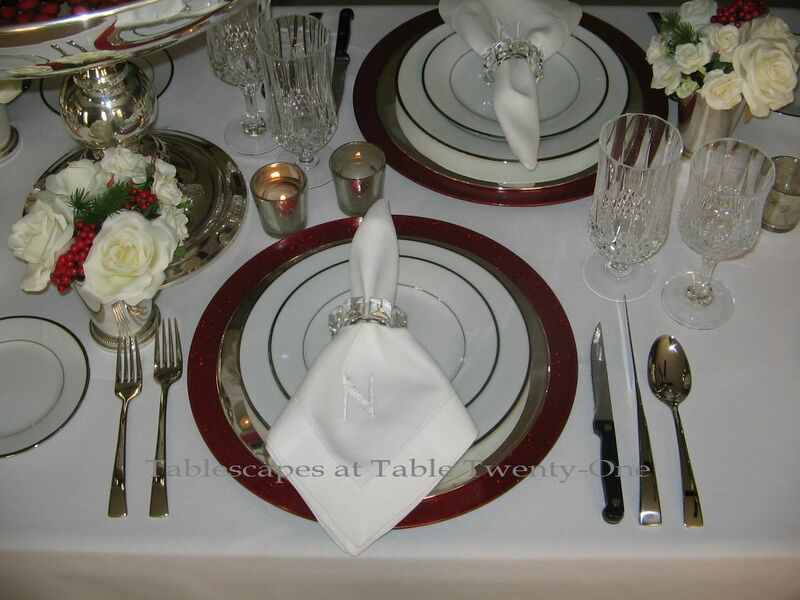 Very formal with the white plates and linens, with just enough sparkle for interest, but not overly glitzy. I can only imagine the most fabulous meal being served at this table. 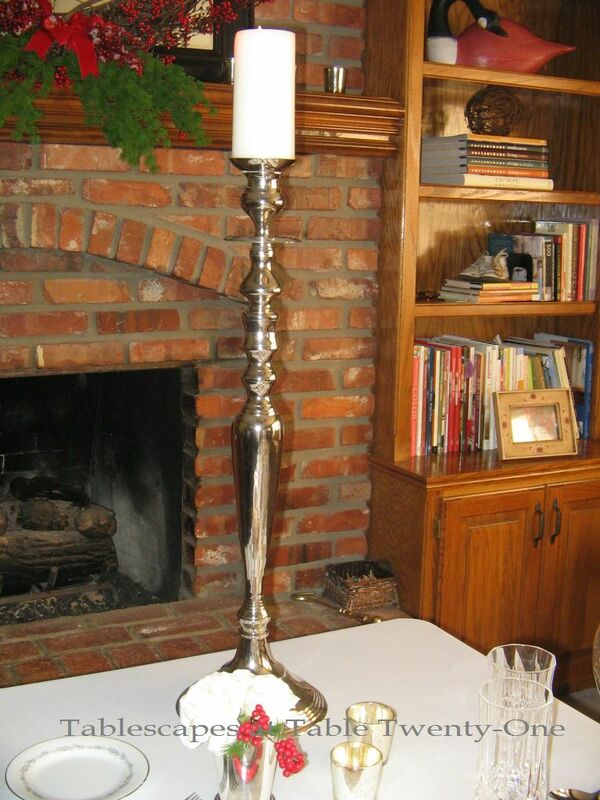 I want you to know I spent an entire evening on ebay looking for super tall candlesticks, because I love the ones you have! Gave up after the first thousand! Girl, you do have the most fabulous tables! I adore the gorgeous candlesticks!! on the “want” list!!!! The cranberries are look awesome with the candles floating among them. Your are incredible when it comes to tablescapes!! I haven’t even thought of playing with dishes and darling I even have new ones to play with. 😦 hope things are well your way. Georgous, darling! Do you think you could arrange for me to win a couple of those great candlesticks? Let me talk to Ramon! How pretty and formal this looks Alycia! I think of a wedding party table when I see a long narrow table dressed up so nicely. I think I’d like the square table if it were in my dining room. It just seems like more people could carry on a conversation at once. I’m going to put cranberries on my blue table for Christmas – thanks for the inspiration! Oh Alycia, I love the cranberries!! Beautifully done. Everything is so elegant. I love this table in front of the fireplace Alycia. The setting is gorgeous, the floating candles and cranberries are wonderful. All of it is luscious! I just love using cranberries for my holiday decor too. We always have at least one arrangement with floating cranberries and candles. What a fun long table this is. I especially love all of the silver and the little vases with roses are wonderful! Beautiful table, Alycia. I have a thing for tall candlesticks…fabulous! 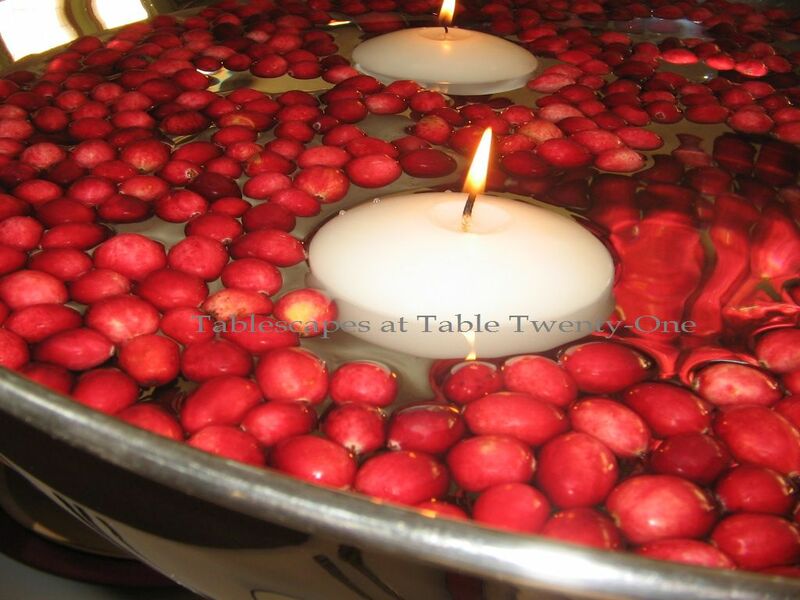 Love the compote filled with floating cranberries and candles. Hi Alycia~ I’ve layered cranberries in hurricanes or vases, but never floated them, how festive! Of course the fact that they’re floating in that spectacular silver vessel makes it all the more fabulous! I adore your rose-filled silver julep cups and the reflection you captured in your silver charger! just beautiful!! Love your crystal!! Beautiful, as always! I adore your candle sticks. Your table is simple but very elegant! I love that everything is beautiful but affordable! I need to be more creative with the things I own. I love the tall candle sticks and the silver bowl of cranberries! I love silver on the table. 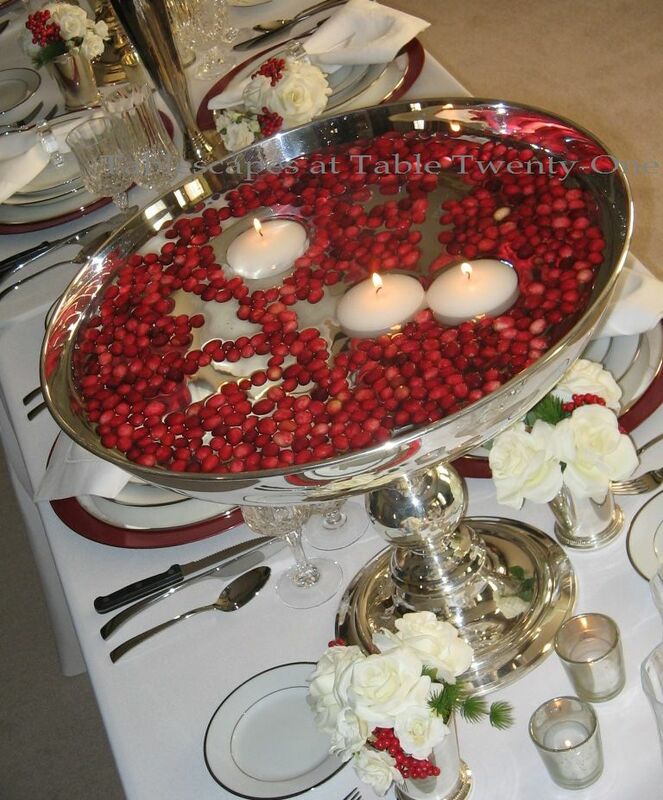 I thank you so much for sharing a beautiful table using cranberries! Alycia, your tables are always fabulous! I love the cranberry theme, so vibrant and perfect for the holidays. The candle holders are great! they make a statement.. It’s wonderful to do 2 tables. square and long. This is really fantastic! You do such a wonderful job! I’m in love with that crystal!! Those candle sticks are fabulous, and all the little vases of flowers so pretty! 99 for cranberries? I paid 2.50 on sale! Very beautiful presentation, you are so talented! This looks like a banquet set for a King! I like the way you staggered the place settings across from each other so that you would be looking at two people face to face, not directly at one person. I am going to remember that! Where are you seating me? Love your table! You are just to good! Thanks for sharing.I will be waiting for my New Years invitation in the mail.